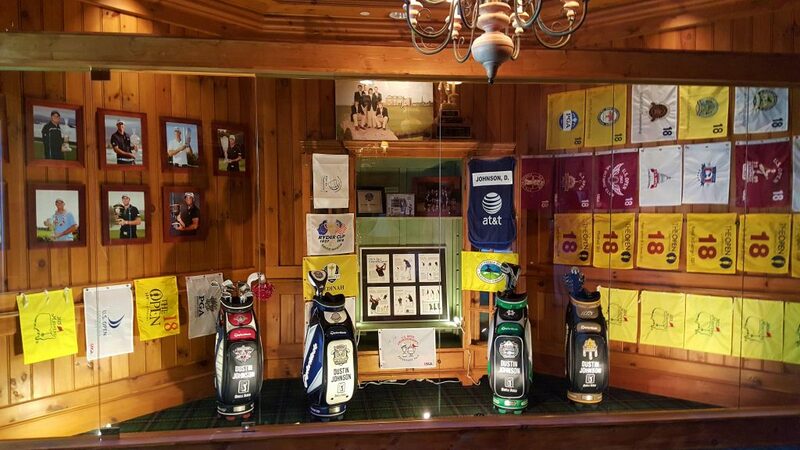 Memorabilia from Dustin Johnson’s PGA Tour career are featured in TPC Myrtle Beach’s clubhouse. MYRTLE BEACH, South Carolina – I love Myrtle Beach. There, I’ve said it again. With 100 courses in a very condensed area, there’s no golf destination quite like it. After about a half dozen visits spread over several years there’s one thing I don’t quite understand about this golf mecca yet, however. None of the professional tours stop there, and only one prominent player, Dustin Johnson, calls Myrtle Beach home. Why is that? I have asked around. The big pro tournaments, I’ve been told, cost too much money. 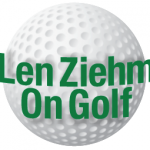 The last one here was the Senior PGA Tour Championship, which ended a seven-year run in 2000 after losing its sponsorship. My guess, though, is that the real reason the pro stops aren’t on the calendar is because Myrtle Beach doesn’t need them for promotional purposes. Besides, this area on the Atlantic seaboard near the North Carolina line is a place to play golf – not watch it. Not only that, but Myrtle Beach does have a big event – the biggest in fact. The World Amateur has been played here for 32 years and draws over 3,000 players annually. More on that event later. 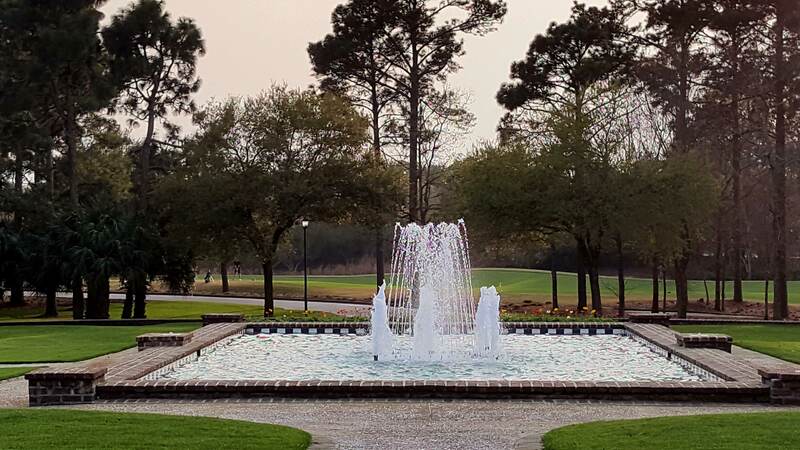 A fountain contributes to the ambience around the clubhouse at True Blue. Perhaps more junior golf programs would stimulate more pro tour players, but Johnson is as big-time a player as there is in the game. He hasn’t won a major title yet, but he’s come close with runner-up finishes in both the 2011 British Open and 2015 U.S. Open. At 31, Johnson has nine wins on the PGA Tour and is currently No. 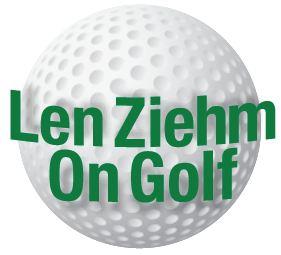 9 in the World Golf Rankings and he’s demonstrated his devotion to the community where his golf game blossomed. 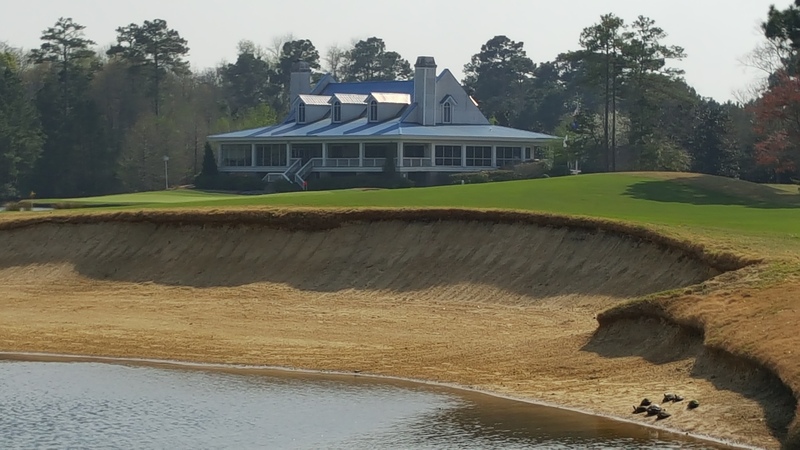 Turtles in the huge bunker are part of drama at True Blue’s finishing hole. Though he grew up in Columbia, S.C., Johnson established himself golf-wise as a college student athlete at Costal Carolina in Myrtle Beach. 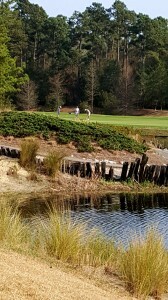 He spent much of his time then at the school’s General James Hackler Course as well as at TPC Myrtle Beach and the TPC connection continues to this day. Basically Johnson has had a 10-year relationship with Myrtle Beach. He hosted the inaugural Dustin Johnson World Junior tournament in February and the Dustin Johnson Golf School is based at TPC Myrtle Beach, which also has a big display of Johnson memorabilia in its clubhouse. Through his charitable foundation Johnson has contributed $250,000 to junior golf in South Carolina and the World Junior is at his home club. This hole, the par-4 17th, had a look like no other on our round at True Blue. Even though he lives more in Florida and California now, Johnson still plays out of Myrtle Beach when he enters a tournament. TPC Myrtle Beach is a good fit for him. 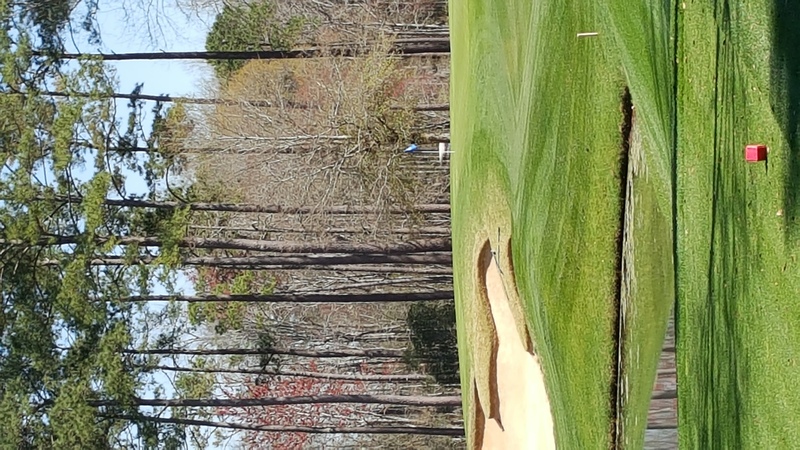 Designed by Tom Fazio with Lanny Wadkins acting as a consultant, that course opened in 1999 and hosted the last of Myrtle Beach’s PGA Tour stops the following year, Tom Watson winning the Senior PGA Tour Championship there. 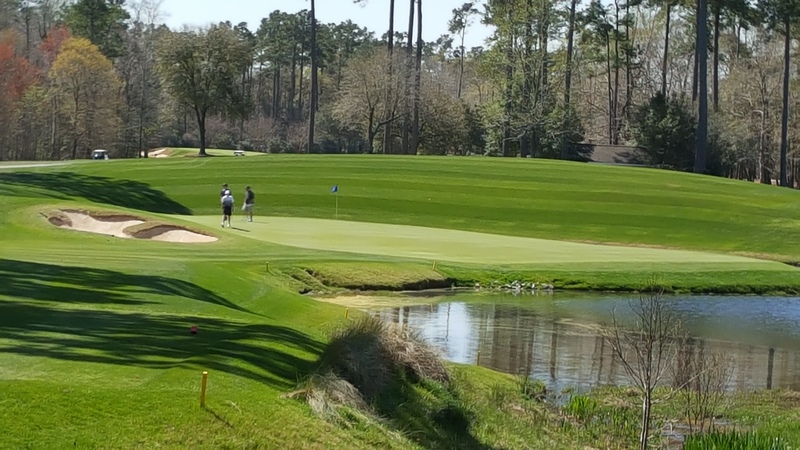 TPC Myrtle Beach, located in Murrells Inlet, it a great track but not necessarily the best course that the area has to offer. Ranking them all is a very subjective thing, and my order of preference keeps changing. Right now top five would be: 1, Caledonia; 2, TPC Myrtle Beach; 3, Dunes Club; 4, True Blue; 5, Dye Course at Barefoot Resort. But that could change tomorrow. What about Grande Dunes, Heritage, King’s North at Myrtle Beach National, the Moorland Course at Legends Resort or Tidewater. They’re all good, and there’s a lot more that I haven’t played. (Just give me time). One misconception about Myrtle Beach to be noted: there’s plenty of other things to do besides golf. It doesn’t have to be all golf, by any means. The thirteenth hole may be the most memorable par-3 at TPC Myrtle Beach. Brookgreen Gardens, for instance, is a beautiful and most interesting place with its stunning sculptures. You could be entertained a whole day there. Then there’s there beautiful beaches, all varieties of lodging, lots of children’s activities (which include elaborate miniature golf attractions), a minor league baseball team and tons of memorable restaurants. Ours included Sea Captain’s House, Wicked Tuna and Old Vienna Café. The first two offer ocean-front views. The nearby Hammock Coast area, which includes the communities of Murrell’s Inlet, Pawley’s Island, Litchfield Beach, Garden City, Georgetown and Andrews, offers more diversions in the way of history, shopping, antiques, art galleries, water sports, dining and nature activities. 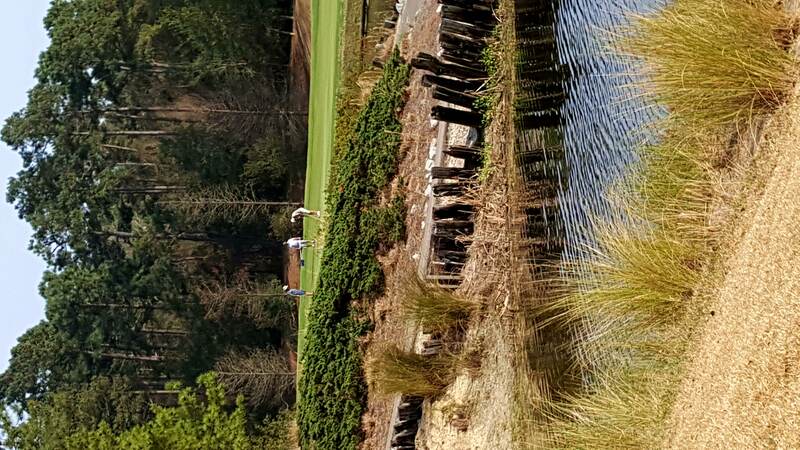 Though you don’t have to play golf every day to enjoy Myrtle Beach – hitting the links would never be a bad option. The next big event golf-wise at Myrtle Beach will be the Hootie & the Blowfish Monday After the Masters Celebrity Pro-Am at the Dye Course at Barefoot. A huge annual party, it’ll be played on April 11. A much bigger deal comes up in August with the 33rd playing of the World Amateur About 35 courses will be used for the week-long event, to be played Aug. 31 to Sept. 2, and tournament coordinator Scott Tomasello expects about 3,500 players to participate. The only state that didn’t have a player in last year’s World Am was Idaho, and the entries included golfers from about 25 foreign countries as well. Early registration for that event starts on March 29. No. 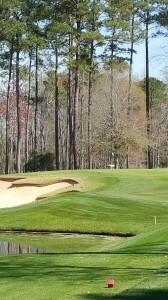 5 at TPC Myrtle Beach is a beautiful 158-yard par-3.